Start here by selecting your state. To list all wurst in a particular category, select the category below, then select "Go." 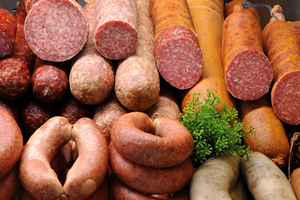 Wurst is a creation of ground meat, bacon, salt, and other spices. In some cases, blood and other organs are also added. The meat mixture is then stuffed into an artificial or natural skin (casing). Wurst is grouped into four categories: Fresh/Raw, Cooked, Boiled, and the well-known Bratwurst. Each category is described below. We've also added a section on Ham below. Although not a wurst, it is an important part of German meals, and thus found in most German delicatessens and used often in German cooking. Fresh, raw wurst is made from raw meat (beef, pork, or lamb), bacon, and spices. There are 500 different kinds of fresh, raw wurst. 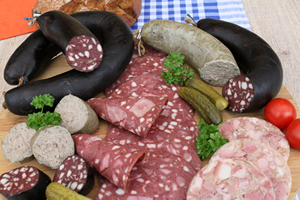 This group includes Salami, Plockwurst, Landjäger, and Zervelatwurst. These sausages are all characterized by a firm texture and a long shelf-life. They are made from ground, raw meat, to which is added salt and other seasonings, as well as fat pieces. The mixture (called "das Brät") is then stuffed into either an artificial or natural skin (intestines), and for certain kinds, they are pressed into shape. Afterward, they are ripened through a drying period in refrigerated rooms. The ripeing process is key in obtaining the desired taste, firmness, aroma, and shelf life of the sausage. Those sausages that are ripened for a very long time are also known as Dauerwurst or Hartwurst (hard wurst). These sausages are made from finely ground raw meat and fat pieces to develop a soft texture. Like the firm sausages, they are stuffed into either an artificial or natural skin (intestines). They are however ripened for only a short period of time and in a low temperature to keep a specific moisture content. Some of the soft, spreadable sausages are also smoked, which adds to its flavor and aroma. Unlike the firm asausages, these sausages have a short shelf life. Included in this group are Mettwurst, Teewurst, and Schmierwurst. 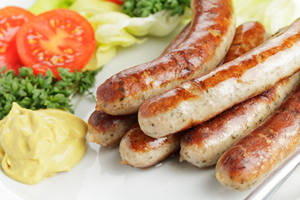 There are 350 different kinds of sausages that are classified as cooked wurst. 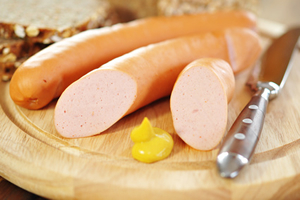 Unlike the fresh, raw wurst, cooked wurst are made of cooked ingredients, such as finely chopped liver, tongue, and/or meat. These ingredients are then mixed with gelatine, blood, grits, or bread to help bind everything together. The mixture is filled into the sausage skins, then cooked again. Some varieties are also smoked for additional flavor. Liverwurst refers to wurst that (1) is spreadable when cold, and (2) has a liver content of over 10%. To keep is spreadable, liverwurst has a high fat content. There are different kinds of liverwurst. Some are made with additional ingedients such as meat, organs, and rind. Some are smooth in texture; others are coarse. These sausages are made from a base mixture of rind and broth (or gelatine and water), which are used to bind the colorful and flavorful ingredients, such as meat, organs, and cooked vegetables. Sülzewurst is sliceable when cold, but becomes liquidy when heated. The taste and appearance of these sausages are strongly influenced by the cooked pork rind and pork blood. The ingredients are cooked, which causes them to bind into a solid mass. This keeps the wurst sliceable when cold. Even when heated, the wurst holds its shape, which makes it good in recipes. The wurst can include various different ingredients, such as meat (Thüringer Rotwurst), tongue (Zungenwurst), and/or bacon. The largest of the three categories, there are 800 kinds of Brühwurst. These sausages are made from finely ground, raw pork, beef, and/or chicken, as well as bacon, salt and other seasonings. Ice or water, along with other additives such as phospate, are added to the meat mixture (Brät) to produce a solid, homogeneous mass. After the meat mixture is filled into its casings, the sausages are scalded at 170° F (70° C). During this scalding phase, the meat mixture solidifies and the sausages develop their well-known, crispy texture. This characteristic remains with the sausages even when re-heated, making them sliceable when both cold and hot. Includes sausages such as Bockwurst, Wiener Würstchen, Gelbwurst, Lyoner, and Fleischkäse. Includes sausages such as Presskopf, Bierschinken, Tiroler. Includes sausages such as Göttinger and Krakauer. The Bratwurst is a unique wurst in that it doesn't fit exactly into any of the above categories. Some are sold raw, yet some are scalded. 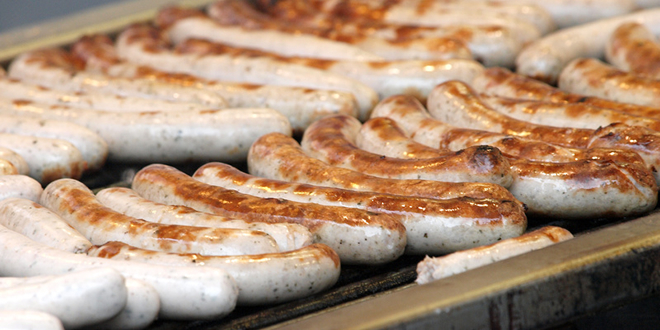 Each region in Germany has its own version of the Bratwurst: Coburger, Fränkische, Hessische, Northern Germany, Nürnberger, Schlesische, Thüringer, etc. Over 50 kinds are available in Germany, differing in size, seasonings, and texture. 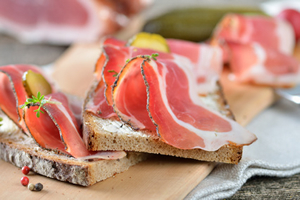 Many countries have their ham specialties, and Germany is no exception. Whether its smoked, cooked, or dried, there are many different kinds of hams. Each ham has its own unique taste and aroma stemming from differences in production and the cut of meat used. Most hams are made from a pork leg, either from the whole leg including the bone and rind or from parts of the leg. Some hams are made from from other parts of the pig, such as the hip and shoulder, and some are made from the parts of other animals. The production of cooked ham is a bit more complex. First, the boneless meat pieces are salt-cured. Then they are pressed into a special form, and run through a unique device, called a Tumbler, that causes the meat pieces to bind together. Once a solid mass, the meat is wrapped in string, aluminum foil, or pressed into a form to hold its shape, the smoked and cooked. The production of raw ham is quite simple: the meat is salt-cured, then either smoked or air-dried. Smoked hams get their flavor and aroma from the temperature and duration of the smoking process, as well as the seasonings and woods used for smoking. Air-dried hams, on the other hand, get their flavor and aroma from the salt used, the length of time the meat is salt-cured, and the duration of the drying time (which last up to 18 months).